Work in your best and most comfortable position with the Adjustable Sit-Stand Wall Mount by Mount-It! This wall mount has a full-motion system feature that offers a wide range of movement so that you can personalize your wall stand. Sit in your most relaxed position while you write blog articles, edit photos and videos, or analyze your company's financial status report. When the time to hustle comes, you can easily tilt the mount to level the monitor in your standing position. Use this Adjustable Sit-Stand Wall Mount for your computer monitors and keyboards, mouse, notebooks and pens, laptops, and other necessities that you use at work. For your convenience, it includes a large keyboard tray and a durable mount. Constructed with heavy-duty steel and Aluminum, this wall mount is also powder-coated to enhance its aesthetic appeal. You can put your laptops or computer monitors and other necessities on this wall mount. You don't have to worry about the brand and the size of your monitor with this product, since this adjustable wall mount is convenient to use with 18- to 27-inch monitors and supports most monitor types. Just make sure that your computers have VESA 75 or VESA 100 bolting patterns. You can also easily shift the monitors from landscape to portrait mode with this wall mount. Upgrade your office's ambiance with the Adjustable Sit-Stand Wall Mount by Mount-It today! This wall mount has a load capacity of up to 15.5 lbs. WALL MOUNT STANDING COMPUTER WORKSTATION - Full motion stand up workstation saves space and promotes healthy movement. Adjust height easily for various users or transition down to sitting. ADJUSTABLE MONITOR WALL MOUNT WITH KEYBOARD TRAY - Complete system that mounts directly to stud and concrete walls. Comes with a dual monitor mount, keyboard/mouse tray, and CPU holder. SIT TO STAND system adjusts height with the help of gas spring counterbalance arm for easy up and down transition. 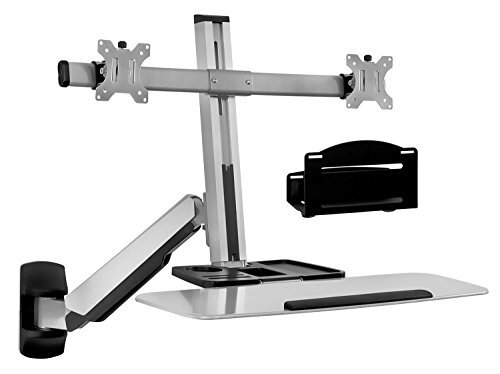 Adjustable arm with 15 degree monitor tilt, 180 degree arm swivel, 360 degree monitor rotation. UNIVERSAL COMPATIBILITY - Monitor mount is VESA 75x75 and 100x100 compatible and fits all monitors up to 27 inches with VESA patterns. Keyboard tray 26" wide to fit full size keyboard and mouse. Foldable keyboard tray saves space when not in use. BONUS FEATURES - Comes with a CPU wall mount, convenient storage tray and cable management function. CPU mount helps to hold the CPU on the wall to save more space for working area. basyxamp;reg; - BL Series Return Shell, 42-1/4w x 24d x 29h, Medium Cherry - Sold As 1 Each - Not freestanding. Use on right or left side of Desk Shell or Credenza Shell to create an amp;quot;Lamp;quot; workstation.